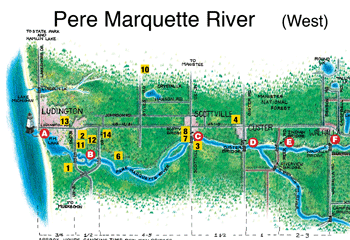 Since our map of the Pere Marquette River is so large, we have divided the river into two sections: east and west. Click on the link below either map to see an enlarged view. 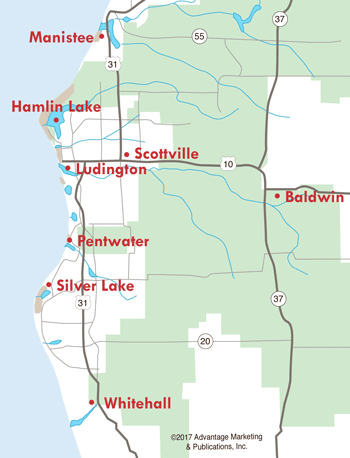 The western section of the Pere Marquette River empties into Pere Marquette Lake where the Lake Michigan Carferry, S.S. Badger is docked, and eventually past Ludington's North Breakwater Light and into Lake Michigan. 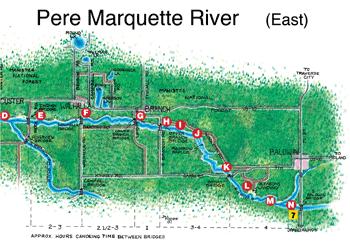 Some of the more popular things to do along this section of the Pere Marquette River would be fishing at the Twin Bridges on Pere Marquette Highway, and canoeing or kayaking the "Loop" starting at the launch near Pere Marquette Expeditions. Scottville's Riverside Park is perhaps the most popular landing along the western section of the Pere Marquette River. The eastern section of the Pere Marquette River is world-famous for fly-fishing. Anglers travel to Baldwin where they can brush up on their casting skills with a fly-fishing school, and shop for the latest fishing gear. Classes are fairly small (ranging from one to two dozen participants) with lots of personal instruction both in a classroom setting and on-stream. Anglers will learn about equipment, knots, different methods of casting, mending lines, stream entomology, behavior and anatomy of trout, reading the water, how to fish with dry and wet flies, fish fighting skills, catch and release methods, river ethics, and much more. Fly-fishing schools typically include lodging, meals, and gear along with instruction.